Ships today if you order in the next 5 hours 46 minutes. Auto Ship & Earn + 138 Points What's this? It's inevitable - with age comes wrinkles. You cannot avoid it. But, you can reduce the appearance of these fine lines and wrinkles. Firming Eye & Neck Serum by Miessence is designed to diminish the appearance of fine lines, wrinkles and crow's feet around your eyes and neck area. 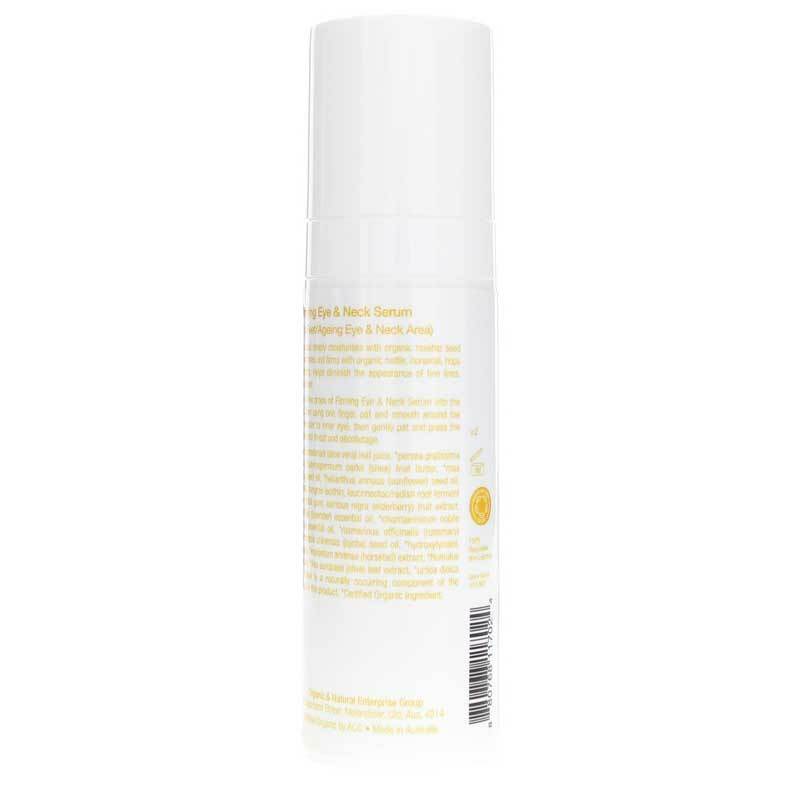 The formula locks in moisture and intensively nourishes you skin. A small amount goes a long way. Try Firming Eye & Neck Serum by Miessence. *Aloe barbadensis (aloe vera) leaf juice, *persea gratissma (avocado) fruit oil, *butyrospermum parkii (shea) fruit butter, *rosa rubiginosa (rosehip) seed oil, *helianthus annuus (sunflower) seed oil, *ethanol (sugarcane), non-GMO lecithin, leuconstoc/radish root ferment filtrate, sclerotium rolfsii gum, sambucus nigra (elderberry) fruit extract, *lavendula angustifolia (lavender) essential oil, *chamaemeium noble (Roman chamomile) essential oil, *rosmarinus officinalis (rosemary) CO2 extract, *simmondsia chinensis (jojoba) seed oil, *hydroxytyrosol, non-GMO xanthan gum, *equisetum arvense (horsetail) extract, *humulus lupulus (hops) extract, *olea europaea (olive) leaf extract, *urtica dioica (nettle) extract. Linalool is a naturally occurring component of the organic essential oils in this product. Pump a few drops into the palm of the hand, then using one finger, pat and smooth around the total eye area (from outer to inner eye), then gently pat and press remainder of concentrate onto throat and decollete. I have used many different firming creams and this one is the most mild out of them all. The other ones I used sometimes stung my skin, but I love how mild this firming cream is! Only thing is I haven't used it for the neck, so not sure if it works there. If you're looking for drastic results, then I don't think this cream is for you, but if you'd like some upkeep and maintence with nice natural results, then this works great! Been using it for years! Love it. Have used Firming Eye & Neck Serum for years and has helped my skin look great. Get compliments all the time. Stopped using it for a few months and regretted it. I love this eye serum. It smells so good and the texture is smooth and feels no greasy. The most important thing is there is no preservative in this eye Serum. The plastic bottle is green and no leaking to the serum. I feel it is safe to use on my face. This is the best eye serum ever!! I can't go a day without it. I actually use it at night also after I wash my face. I buy 5 at a time just so i don't run out. There are things in life that are a nessesity and this product is one of them.